Territorial anthem: "Virgin Islands March"
The United States Virgin Islands (USVI; also called the US Virgin Islands or American Virgin Islands), officially the Virgin Islands of the United States, is a group of islands in the Caribbean and an unincorporated and organized territory of the United States. The islands are geographically part of the Virgin Islands archipelago and are located in the Leeward Islands of the Lesser Antilles. The U.S. Virgin Islands consists of the main islands of Saint Croix, Saint John, and Saint Thomas, and many other surrounding minor islands. The total land area of the territory is 133.73 square miles (346.36 km2). The territory's capital is Charlotte Amalie on the island of St. Thomas. Previously known as the Danish West Indies of the Kingdom of Denmark–Norway, they were sold to the United States by Denmark in the Treaty of the Danish West Indies of 1916. They are classified by the United Nations as a Non-Self-Governing Territory, and are currently an organized, unincorporated United States territory. The U.S. Virgin Islands are organized under the 1954 Revised Organic Act of the Virgin Islands and have since held five constitutional conventions. The last and only proposed Constitution, adopted by the Fifth Constitutional Convention of the U.S. Virgin Islands in 2009, was rejected by the U.S. Congress in 2010, which urged the convention to reconvene to address the concerns Congress and the Obama Administration had with the proposed document. The Fifth Constitutional Convention of the U.S. Virgin Islands met in October 2012 to address these concerns, but was not able to produce a revised Constitution before its October 31 deadline. In 2010 the population was 106,405, and mostly Afro-Caribbean. Tourism and related categories are the primary economic activity, employing a high percentage of the civilian non-farm labor force that totaled 42,752 persons in 2016 (the total non-farm labor force was 48,278 persons). Private sector jobs made up 71 percent of the total workforce. The average private sector salary was $34,088 and the average public sector salary was $52,572. In a May 2016 report, some 11,000 people were categorized as being involved in some aspect of agriculture in the first half of 2016 but this category makes up a small part of the total economy. (The islands have a significant rum-manufacturing sector.) At that time, there were approximately 607 manufacturing jobs and 1,487 natural resource and construction jobs. The single largest employer was the government. In mid-February 2017, the USVI was facing a financial crisis due to a very high debt level of $2 billion and a structural budget deficit of $110 million. Then early August 2017, the U.S. Virgin Islands government was rejected from the bond market. The U.S. Virgin Islands were originally inhabited by the Ciboney, Carib, and Arawaks. The islands were discovered by the Spanish and named by Christopher Columbus on his second voyage in 1493 for Saint Ursula and her virgin followers. Over the next two centuries, the islands were held by several European powers, including Spain, Great Britain, the Netherlands, France, and Denmark–Norway. The Danish West India and Guinea Company are also credited with naming the island St. John (Danish: Sankt Jan). The Danish crown took full control of St. John in 1754 along with St. Thomas and St. Croix. Sugarcane plantations such as the famous Annaberg Sugar Plantation were established in great numbers on St. John because of the intense heat and fertile terrain that provided ideal growing conditions. The establishment of sugarcane plantations also led to the buying of more slaves from Africa. In 1733, St. John was the site of one of the first significant slave rebellions in the New World when Akwamu slaves from the Gold Coast took over the island for six months. The Danish were able to defeat the enslaved Africans with help from the French in Martinique. Instead of allowing themselves to be recaptured, more than a dozen of the ringleaders shot themselves before the French forces could capture them and call them to account for their activities during the period of rebel control. It is estimated that by 1775, slaves outnumbered the Danish settlers by a ratio of 5:1. After a slavery rebellion in Saint Croix, slavery was abolished by governor Peter von Scholten on July 3, 1848, now celebrated as Emancipation Day. Although some plantation owners refused to accept the abolition, some 5,000 Black people were freed while another 17,000 remained enslaved. Over the following years, strict labor laws were implemented several times, leading to the 1878 St. Croix labor riot. Planters began to abandon their estates, causing a significant drop in population and the overall economy. Additionally, the 1867 hurricane and earthquake and tsunami had further diminished the economy. For the remainder of the period of Danish rule the islands were not economically viable and significant transfers were made from the Danish state budgets to the authorities in the islands. In 1867 a treaty to sell St. Thomas and St. John to the United States was agreed, but the sale was never effected. A number of reforms aimed at reviving the islands' economy were attempted, but none had great success. A second draft treaty to sell the islands to the United States was negotiated in 1902 but was defeated in the upper house of the Danish parliament in a tie vote (because the opposition carried a 97-year-old life member into the chamber). The onset of World War I brought the reforms to a close and again left the islands isolated and exposed. During the submarine warfare phases of the war, the United States, fearing that the islands might be seized by Germany as a submarine base, again approached Denmark about buying them. After a few months of negotiations, a selling price of $25 million in United States gold coin was agreed, equivalent to $575.61 million in 2018 dollars. At the same time the economics of continued possession weighed heavily on the minds of Danish decision makers, and a consensus in favor of selling emerged in the Danish parliament. The Treaty of the Danish West Indies was signed in August 1916, with a referendum on the sale held in Denmark in December 1916 in which voters voted to confirm the decision. The deal was finalized on January 17, 1917, when the United States and Denmark exchanged their respective treaty ratifications. The United States took possession of the islands on March 31, 1917 and the territory was renamed the Virgin Islands of the United States. Every year Transfer Day is recognized as a holiday, to commemorate the acquisition of the islands by the United States. Water Island, a small island to the south of St. Thomas, was initially administered by the US federal government and did not become a part of the United States Virgin Islands territory until 1996, when 50 acres (20 ha) of land was transferred to the territorial government. The remaining 200 acres (81 ha) of the island were purchased from the United States Department of the Interior in May 2005 for $10, a transaction that marked the official change in jurisdiction. US citizenship was granted to many inhabitants of the islands in 1927 and 1932. The US dollar was adopted in the territory in 1934 and from 1935 to 1939 the islands were a part of the United States customs area. The 1936 Organic Act and the 1954 Revised Organic Act established the local government. In 1970 Virgin Islanders elected their first governor, Melvin H. Evans. In 1966 Hess Oil began construction on an oil refinery. Until February 2012, the Hovensa plant located on St. Croix was one of the world's largest petroleum refineries and contributed about 20% of the territory's GDP. The facility stopped exporting petroleum products in 2014. In the final year of full refinery operations, the value of exported petroleum products was $12.7 billion (2011 fiscal year). After being shut down, it has operated as no more than an oil storage facility; the closure had provoked a local economic crisis. Hurricane Hugo struck the U.S. Virgin Islands in 1989, causing catastrophic physical and economic damage, particularly on the island of St. Croix. The territory was again struck by Hurricane Marilyn in 1995, killing eight people and causing more than $2 billion in damage. The islands were again struck by Hurricanes Bertha, Georges, Lenny, and Omar in 1996, 1998, 1999, and 2008, respectively, but damage was not as severe in those storms. In September 2017, Category 5 Hurricane Irma caused catastrophic damage, particularly to St. John and St. Thomas. Just two weeks later, Category 5 Hurricane Maria's weaker outer eyewall crossed St. Croix. Sustained winds at the Sandy Point National Wildlife Refuge on St. Croix reached 99 to 104 mph (159 to 167 km/h) and gusted to 137 mph (220 km/h). Weather stations on St. Croix recorded 5 and 10 inches of rain from the hurricane, and estimates for St. John and St. Thomas were somewhat less. The hurricane killed two people, both in their homes: one person drowned and another was trapped by a mudslide. A third person had a fatal heart attack during the hurricane. The hurricane caused extensive and severe damage to St. Croix. After both hurricanes, the office of V.I. congresswoman Stacey Plaskett stated that 90% of buildings in the Virgin Islands were damaged or destroyed and 13,000 of those buildings had lost their roofs. The Luis Hospital suffered roof damage and flooding, but remained operational. The U.S. Virgin Islands are in the Atlantic Ocean, about 40 miles (60 km) east of Puerto Rico and immediately west of the British Virgin Islands. They share the Virgin Islands Archipelago with the Puerto Rican Virgin Islands of Vieques and Culebra (administered by Puerto Rico), and the British Virgin Islands. The territory consists of three main islands: St. Thomas, St. John, and St. Croix, as well as several dozen smaller islands. The main islands have nicknames often used by locals: "Twin City" (St. Croix), "Rock City" (St. Thomas), and "Love City" (St. John). The combined land area of the islands is roughly twice the size of Washington, D.C. The U.S. Virgin Islands are known for their white sand beaches, including Magens Bay and Trunk Bay, and deepwater harbors along the Anegada Passage, including Charlotte Amalie and Christiansted. 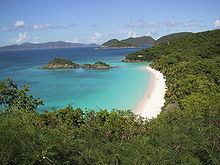 Like most Caribbean islands, the islands of the Virgin Islands, including St. Thomas, are volcanic in origin and hilly. The highest point is Crown Mountain, St. Thomas (1,555 ft or 474 m). The United States Virgin Islands enjoy a tropical climate, with little seasonal change throughout the year. Rainfall is concentrated in the high sun period (May through October), while in the winter the northeast trade winds prevail. Summer and winter high temperatures differ by 5 °F (3 °C) or less on average. The U.S. Virgin Islands are an organized, unincorporated United States territory. Although they are US citizens, US Virgin Islanders residing in the territory are ineligible to vote for the President of the United States. They are, however, eligible to vote if they become residents of mainland US states. The US Democratic and Republican parties allow U.S. Virgin Islands citizens to vote in their presidential primary elections for delegates to the respective national conventions. People born in the U.S. Virgin Islands derive their US citizenship from Congressional statute. The main political parties in the U.S. Virgin Islands are the Democratic Party of the Virgin Islands, the Independent Citizens Movement, and the Republican Party of the Virgin Islands. Additional candidates run as independents. At the national level, the U.S. Virgin Islands elect a delegate to Congress from their at-large congressional district. The elected delegate, while able to vote in committee, cannot participate in floor votes. The current House of Representatives delegate is Stacey Plaskett, a Democrat. Like other territories, the U.S. Virgin Islands does not have U.S. Senators. At the territorial level, fifteen senators – seven from the district of St. Croix, seven from the district of St. Thomas and St. John, and one senator at-large who must be a resident of St. John – are elected for two-year terms to the unicameral Virgin Islands Legislature. There is no limit as to the number of terms they can serve. The U.S. Virgin Islands have elected a territorial governor every four years since 1970. Previous governors were appointed by the President of the United States. The U.S. Virgin Islands have a District Court, Superior Court and the Supreme Court. The District Court is responsible for federal law, while the Superior Court is responsible for U.S. Virgin Islands law at the trial level and the Supreme Court is responsible for appeals from the Superior Court for all appeals filed on or after January 29, 2007. Appeals filed prior to that date are heard by the Appellate Division of the District Court. Appeals from the federal District Court are heard by the United States Court of Appeals for the Third Circuit, located in Philadelphia, Pennsylvania. District Court judges are appointed by the US president, while Superior Court and Supreme Court judges are appointed by the governor. On October 21, 1976, President Gerald Ford signed Pub.L. 94–584 authorizing the people of the United States Virgin Islands to organize a government pursuant to a constitution, which would be automatically approved if Congress did not act within 60 days. On May 26, 2009 the U.S. Virgin Islands Fifth Constitutional Convention adopted a proposed Constitution of the Virgin Islands, which was submitted by President Barack Obama to Congress on March 1, 2010. On June 30, 2010, President Obama signed Pub.L. 111–194 in which Congress rejected the proposed constitution and urged the constitutional convention to reconvene. As of early 2017, the territory still did not have its own constitution. Little has been achieved on this front since 2009 when a proposed constitution was contested by the US Justice Department on the grounds that the powers sought exceeded what would be considered allowable under territorial status. In September 2012, the Fifth Constitutional Convention of the U.S. Virgin Islands was unable to come to a decision on the contents of a proposed constitution by the October 31 deadline. Administratively, the U.S. Virgin Islands are divided into two (2) districts: the Saint Thomas & Saint John district, and the Saint Croix district. However, the U.S. Census Bureau divides each of the 3 main islands into 3 separate statistical entities (which are further divided into twenty (20) sub-districts). Below is the U.S. Census Bureau's division model. Each of the 3 main islands of the U.S. Virgin Islands is counted as a county-equivalent by the U.S. Census Bureau, with the following FIPS codes: 78010 for Saint Croix, 78020 for Saint John, and 78030 for Saint Thomas. While a Danish possession, the Islands were divided into "quarters" (five on St. John and nine on St. Croix) which were further divided into many dozens of "estates". Estate names are still used to write addresses; estates and quarters are used in describing real estate, especially on St. John and St. Croix. More densely populated towns such as Frederiksted and Christiansted on St. Croix were historically referred to as "districts", in contrast to the surrounding plantation land. A 1993 referendum on status attracted only 31.4% turnout, and so its results (in favor of the status quo) were considered void. No further referenda have been scheduled since. In 2004, the 25th Legislature of the Virgin Islands established the Fifth Constitutional Convention, a constitutional convention gathered in order to draft a new constitution. In June 2009, Governor John de Jongh, Jr. rejected the resulting constitutional draft, saying the terms of the document would "violate federal law, fail to defer to federal sovereignty and disregard basic civil rights." A lawsuit filed by members of the Convention to force Governor de Jongh to forward the document to President Barack Obama was ultimately successful. The President of the United States forwarded the proposal to Congress—which then had 60 days to approve or reject the document—in May 2010, along with a report noting concerns raised by the United States Department of Justice and restating the issues noted by Governor de Jongh. A US Congressional resolution disapproving of the proposed constitution and requesting that the Fifth Constitutional Convention reconvene to consider changes to address these issues was signed into law by President Obama on June 30, 2010. Months later, a federal lawsuit was filed in the Federal District Court of the Virgin Islands in 2011. The lawsuit claimed that the United States had to provide US Virgin Islanders with the ability to be represented in Congress and vote for US President. The case is Civil No. 3:11-cv-110, Charles v. U.S. Federal Elections Commission et al. (3:11-cv-00110-AET-RM). It alleged that racial discrimination present in an all-white and segregated US Congress of 1917 was the impetus to deny the right to vote to a majority non-white constituency. The case was ultimately dismissed and closed on August 16, 2012 by District Judge Anne E. Thompson from the Federal District Court of the Virgin Islands, Division of St. Croix. The Fifth Constitutional Convention of the U.S. Virgin Islands met in October 2012 but was not able to produce a revised Constitution before its October 31 deadline. In 2016, the United Nations's Special Committee on Decolonisation recommended to the UN's General Assembly that this larger body should assist in "decolonization" and help the people of the territory to "determine freely their future political status". Specifically, the Special Committee recommended that the "views of the people of the United States Virgin Islands in respect of their right to self-determination should be ascertained" and that the UN should "actively pursue a public awareness campaign aimed at assisting the people of the United States Virgin Islands with their inalienable right to self-determination and in gaining a better understanding of the options for self-determination". Law enforcement services are provided by the United States Virgin Islands Police Department (USVIPD). Although a public airport, Henry E. Rohlsen Airport has serviced aircraft from the United States Air Force, as well as the United States Army. According to a report on the first half of 2016 by the VI Bureau of Economic Research, the unemployment rate was 11.5 percent. In May 2016 the islands' Bureau of Economic Research indicated that there were 37,613 non-agricultural wage and salary jobs in the islands. This report states that the "leisure and hospitality sector" employed an average of 7,333 people. The retail trade sector, which also serves many tourists, averaged another 5,913 jobs. Other categories which also include some tourism jobs include Arts and Entertainment (792 jobs), Accommodation and Food (6,541 jobs), Accommodation (3755 jobs), Food Services and Drink (2,766 jobs). A large percentage of the 37,613 non-farm workers are employed in dealing with tourists. Serving the local population is also part of the role of these sectors. Analysts reviewing the economy often point to the closure of the HOVENSA oil refinery, the islands’ largest private sector employer, in early 2012 as having a major negative impact on the territory's economy. In late 2013, the Reserve Bank of New York's Research and Statistics Group pointed out that manufacturing employment dropped by 50 percent in May 2012, and by another 4 percent by November 2012, and that the GDP fell by 13 percent, "mainly due to an 80 percent drop-off in exports (mostly refined petroleum)". On the other hand, tourism and some other service industries were growing. As well, the 2010 census indicated that a relatively high share of the adult population is in the labor force: 66 percent, versus 65 percent on the mainland and well below 50 percent in Puerto Rico. The bottom line in this report however is that "it may also be worthwhile to look at the physical infrastructure and human capital built up over the years, with an eye toward using it for other types of productive economic activity". A May 2016 report by Bloomberg expressed concern about the islands' tax-supported debt load. By January 23, 2017 this had increased to $2 billion. That translated to a per capita debt of $19,000, which was higher than the per capita debt in Puerto Rico which was undergoing a severe financial crisis at the time. A Debtwire analyst writing in Forbes indicated that nothing short of a miracle would prevent a financial collapse. Another area of concern was the structural budget deficit which was at $110 million in mid February 2017. The government instituted a new law in March 2017 with new or increased taxes on rum, beer, tobacco products and sugary drinks, as well as internet purchases and timeshare unit owners. Tourism, trade, and other service-oriented industries are the primary economic activities, accounting for nearly 60% of the GDP. Approximately 2.5 million tourists per year visit, most arriving on cruise ships. Such visitors do not spend large amounts of money ($146.70 each on average) but as a group, they contributed $339.8 million to the economy in 2012. However, the travel industry warned in late 2014 that work needs to be done for USVI tourism practices to meet 21st century demands. "The needs of the community and the tourists may be diametrically opposed; however, for tourism to flourish cooperation is a necessity. From reduced energy costs to increased educational opportunities, from improved healthcare to a continued reduction in crime, these and many other challenges must be tackled. There is only now." Additionally, the islands frequently are a starting point for private yacht charters to the neighboring British Virgin Islands. Euromonitor indicates that over 50 percent of the workforce is employed in some tourism-related work. The manufacturing sector consists of mainly rum distilling. The agricultural sector is small, with most food being imported. International business and financial services are a small but growing component of the economy. Most energy is also generated from imported oil, leading to electricity costs four to five times higher than the U.S. mainland. The Virgin Islands were the highest oil consumers per capita in the world in 2007. The Virgin Islands Water and Power Authority also uses imported energy to operate its desalination facilities to provide fresh water. The CIA World Factbook lists the value of federal programs and grants — $241.4 million in 2013, 19.7% of the territory's total revenues — and that "the economy remains relatively diversified. Along with the tourist industry, it appears that rum exports, trade, and services will be major income sources in future years". The U.S. Virgin Islands are an independent customs territory from the mainland United States and operate largely as a free port. US citizens thus do not have to clear customs when arriving in the U.S. Virgin Islands, but do when traveling to the mainland. Local residents are not subject to US federal income taxes on U.S. Virgin Islands source income; they pay taxes to the territory equal to what their federal taxes would be if they lived in a state. The Henry E. Rohlsen International Airport serves St. Croix and the Cyril E. King International Airport serves St. Thomas and St. John. The U.S. Virgin Islands is the only US jurisdiction that drives on the left. This was inherited from what was then-current practice on the islands at the time of the 1917 transfer of the territory to the United States from Denmark. However, because most cars in the territory are imported from the mainland United States, the cars in the territory are left-hand drive. As in other US territories, U.S. Virgin Islands mail service is handled by the United States Postal Service, using the two-character state code "VI" for domestic mail delivery. ZIP codes are in the 008xx range. As of January 2010[update], specifically assigned codes include 00801–00805 (St Thomas), 00820–00824 (Christiansted), 00830–00831 (St. John), 00840–00841 (Frederiksted), and 00850–00851 (Kingshill). The islands are part of the North American Numbering Plan, using area code 340, and island residents and visitors are able to call most toll-free US numbers. The U.S. Virgin Islands are located in the Atlantic Standard Time zone and do not participate in daylight saving time. When the mainland United States is on Standard Time, the U.S. Virgin Islands are one hour ahead of Eastern Standard Time. When the mainland United States is on daylight saving time, Eastern Daylight Time is the same as Atlantic Standard Time. In the territory, the population in 2010 was distributed with 31.6% under the age of 18, 8.0% from 18 to 24, 27.1% from 25 to 44, 24.9% from 45 to 64, and 8.4% who were 65 years of age or older. The median age was 33 years. For every 100 females, there were 91.4 males. For every 100 females ages 18 and up, there were 87.7 males. The annual population growth is −0.12%. English is currently the dominant language and Spanish is spoken by about 17% of the population. Other languages are spoken by 11% of the population. English has been the predominant language since 1917 when the islands were transferred from Denmark to the United States. Under Danish rule, the official language was Danish, but it was solely the language of administration and spoken by Danes, a tiny minority of the overall population that primarily occupied administrative roles in colonial Danish West Indian society. However, place names and surnames of Denmark-Norway origin still remain among natives. Although the U.S. Virgin Islands was a Danish possession during most of its colonial history, Danish never was a spoken language among the populace, black or non-Danish white, as the majority of plantation and slave owners were of Dutch, English, Scottish, Irish, or Spanish descent. Even during Danish ownership, Dutch, another Germanic language like Danish, was more common, at least during some of those 245 years, specifically on St. Thomas and St. John. In St. Croix, English was the dominant language. St. Croix was owned by the French until 1733 when the island was sold to the Danish West Indian and Guinea Company. By 1741 there were five times as many English on the island as Danes. English Creole emerged on St. Croix more so than Dutch Creole, which was more popular on St. Thomas and St. John. Other languages spoken in the Danish West Indies included Irish, Scots, Spanish, and French, as well as Virgin Islands English Creole. Christianity is the dominant religion in the U.S. Virgin Islands. According to Pew Research Center, 94.8% of the population was Christian in 2010. Baptist, Roman Catholic and Episcopalian were the largest Christian denominations in the 2010 census. Owing to both their Danish past and American present, Protestantism on the islands has long been widespread. It was first introduced when Lutheranism was brought to the islands in the Danish colonization. The Danish crown also allowed other religious traditions on the islands including Anglicanism, Roman Catholicism, the Moravian Church and other Protestant groups. Historically, St. Thomas and St. Croix are known for missionary efforts undertaken by the Moravian missionaries. They were allowed on the islands by the Danish royal court, but came under scrutiny when they denounced slavery. [page needed] A number of neo-Protestant traditions including Pentecostalism, various evangelical Protestants and the Seventh-day Adventists arrived later with the switch of allegiance from Denmark to the United States. There is also a strong Roman Catholic presence. Rastafari is also prevalent. St. Thomas is home to one of the oldest Jewish communities in the Western Hemisphere as Sephardic Jews began to settle the island in the 18th century as traders and merchants. The St. Thomas Synagogue in Charlotte Amalie is the second oldest synagogue on American soil and oldest in terms of continuous usage. The United States Virgin Islands Department of Education serves as the territory's education agency, and has two school districts: St. Thomas-St. John School District and St. Croix School District. The culture of the Virgin Islands reflects the various people that have inhabited the present-day U.S. Virgin Islands and British Virgin Islands, both despite their political separation having kept close cultural ties. The culture derives chiefly from West African, European and American cultures, in addition to the influences from the immigrants from the Arab world, India and other Caribbean islands. The island was strongly influenced by the Dutch, French and Danish during the periods of control the island were under these powers. St. John On Island Times, news and information on St. John, USVI. ^ "U.S. Virgin Islands – 2010 Census Results" (PDF). census.gov. US Census Bureau. Retrieved April 18, 2017. ^ "Gross Domestic Product Per Capita for U.S. Virgin Islands". 5 May 2017. Retrieved 14 July 2017. 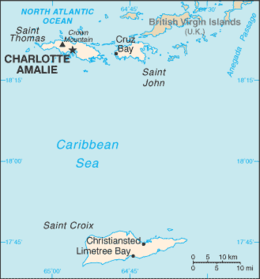 ^ a b "CIA – The World Factbook-US Virgin Islands". Retrieved March 25, 2012. ^ 2010 Population Counts for the U.S. Virgin Islands Archived November 1, 2012, at the Wayback Machine, US Census Bureau. ^ "U.S. Virgin Islands Economic Review – VI" (PDF). VI Bureau of Economic Research. VI Bureau of Economic Research. May 15, 2016. Archived from the original (PDF) on November 30, 2016. Retrieved February 15, 2017. ^ a b Baribeau, Simone (January 23, 2017). "United States Virgin Islands Risks Capsizing Under Weight Of Debt". Forbes. Forbes. Retrieved February 15, 2017. How far behind is the United States Virgin Islands (USVI) from facing the same sort of financial crisis as Puerto Rico? Not very. ^ Gilbert, Ernice (February 16, 2017). "GOVERNMENT HAS TWO DAYS CASH ON HAND LEFT, FINANCE COMMISSIONER REVEALS". VI Consortium. VI Consortium. Retrieved February 16, 2017. ^ "A Brief History of the Danish West Indies, 1666–1917". Danish National Archives. Retrieved 26 January 2017. ^ "Virgin Islands History". VI Now. VInow.com. 2015. Retrieved February 15, 2017. In the Danish West Indies slaves labored mainly on sugar plantations. Cotton, indigo and other crops were also grown. Sugar mills and plantations dotted the islands hilly landscapes. Each islands economy prospered through sugar plantations and slave trading. While St. John and St. Croix maintained a plantation economy, St. Thomas developed into a prosperous center of trade. Slave rebellion on St. John and St. Croix are well documented. Legitimate trade and business on St. Thomas influenced a different society where many more slaves were given freedom and an opportunity outside of plantation life. ^ Poinski, Megan. "Water Island appears frozen in time, but big plans run under the surface – V.I. says land acquired from the feds is about to undergo large-scale improvements". The Virgin Islands Daily News, November 18, 2005, online edition. Retrieved September 6, 2007. ^ United States Department of the Interior (1934). Annual Report of the Department of the Interior 1934. US Government Printing Office. ^ various United States governmental bureaus (1950). Statistical Abstract of the United States. US Government Printing Office. ^ Daniel Shea (Daily News Staff) (January 19, 2012). "HOVENSA closing – News". Virgin Islands Daily News. Archived from the original on July 28, 2012. Retrieved December 13, 2012. ^ O'Connor, Brian (September 21, 2017). "St. Croix barely escapes worst of Maria's wrath". The Virgin Islands Daily News. Retrieved September 22, 2017. ^ National Weather Service, SFO San Juan (November 22, 2017). "Major Hurricane Maria". National Weather Service. ^ Carlson, Suzanne (October 3, 2017). "Five hurricane-related deaths confirmed". The Virgin Islands Daily News. Retrieved November 12, 2017. ^ O'Connor, Brian (September 22, 2017). "Federal disaster relief begins on St. Croix". The Virgin Islands Daily News. Retrieved September 23, 2017. ^ J.B. Wogan (October 6, 2017). "After Hurricanes, Public Housing May Never Get Rebuilt". Governing. ^ O'Connor, Brian (September 21, 2017). "Maria leaves St. Croix with a working hospital". The Virgin Islands Daily News. Retrieved September 22, 2017. ^ Slawych, Diane. "Love is in the air". CANOE.ca. Archived from the original on July 18, 2012. Retrieved January 25, 2008. ^ "The World Factbook". CIA. Retrieved 2017-08-01. ^ "Average Conditions Saint Thomas, VI". weather.com. Archived from the original on December 3, 2010. Retrieved May 16, 2010. ^ "Presidential election in the U.S. Virgin Islands, 2016". Ballotpedia. Ballotpedia. July 1, 2016. Retrieved February 24, 2017. Law.cornell.edu. Cornell Law School. Legal Information Institute. 8 U.S. Code § 1406 - Persons living in and born in the Virgin Islands. Retrieved September 21, 2018. ^ http://time.com/3736845/john-oliver-last-week-tonight-voting-rights/ "Watch John Oliver Cast His Ballot for Voting Rights for U.S. Territories". Time. March 9, 2015. Retrieved September 21, 2018. ^ "Legislature of the Virgin Islands". Ballotpedia. Ballotpedia. July 1, 2016. Retrieved February 24, 2017. ^ Corbin, Dr. Carlyle G. (January 5, 2017). "Choose or Lose: U.S. Virgin Islands in 2017". Pacific Island Times. Pacific Island Times. Retrieved February 16, 2017. ^ Mattei, Lou, Virgin Islands Daily News (October 29, 2012). "Constitutional Convention Meeting Marred by Arguments, Technical Snarls". High Beam Research. Cengage Learning. Retrieved February 16, 2017. ^ Lou Mattei (Daily News Staff) (September 29, 2012). "Constitutional Convention meeting marred by arguments, technical snarls – News". Virgin Islands Daily News. Retrieved April 8, 2013. ^ http://www.legvi.org/senators/st-thomasst-john/senator-marvin-a-blyden/ legvi.org. Senator Marvin A. Blyden. Retrieved September 21, 2018. ^ https://www.usgs.gov/faqs/how-many-counties-are-there-united-states USGS. How many counties are there in the United States? Retrieved September 21, 2018. ^ https://www.census.gov/geo/reference/codes/cou.html 2010 FIPS Codes for Counties and County Equivalent Entities. Census.gov. Retrieved September 21, 2018. ^ http://www.statoids.com/uvi.html Districts of the United States Virgin Islands. Statoids.com. Retrieved September 21, 2018. ^ "St John Map of Estates on St John |US Virgin Islands Real Estate". American Paradise. Retrieved December 13, 2012. ^ "American Virgin Islands Maps – Map of St. Croix Condos". American-virgin-islands.com. Retrieved December 13, 2012. ^ Poinski, Megan, "Governor Rejects Constitution Draft", article in The Virgin Islands Daily News, June 13, 2009. Retrieved July 29, 2009. ^ Office of the White House Press Secretary (June 30, 2010). "Statement by the Press Secretary on S.J.Res. 33". Archived from the original on July 15, 2010. Retrieved June 30, 2010. ^ "USVI Constitutional Convention mandated to reconsider autonomous proposals". Virgin Islands News Online. June 30, 2010. ^ Lou Mattei (Daily News Staff) (September 29, 2012). "Constitutional Convention meeting marred by arguments, technical snarls – News". Virgin Islands Daily News. Archived from the original on February 5, 2013. Retrieved April 8, 2013. ^ Mattei, Lou; Virgin Islands Daily News (October 29, 2012). "Constitutional Convention Meeting Marred by Arguments, Technical Snarls". High Beam Research. Cengage Learning. Archived from the original on February 18, 2017. Retrieved February 16, 2017. ^ "Economic Census Shows the U.S. Virgin Islands Generated $6.8 Billion in Sales in 2012". US Census. Department of Commerce. July 15, 2014. Retrieved February 18, 2017. ^ "Fact Finder". US Census. Department of Commerce. 2011. Retrieved February 18, 2017. ^ Bram, Jason (November 15, 2013). "A Long Road to Economic Recovery for the U.S. Virgin Islands". Liberty Street Economics. Retrieved December 3, 2018. Looking ahead, we note that the tropical weather and picturesque beaches will continue to draw tourists, and natural resources bode well for rum production. ^ Chappatta, Brian (May 31, 2016). "More in Debt Than Puerto Rico, the Virgin Islands Rejects Rescue". Bloomberg. Bloomberg. Retrieved February 15, 2017. ^ Gilbert, Ernice (February 15, 2017). "FINANCIAL CRISIS: MAPP EXECUTIVE ORDER SUSPENDS HIRING, TRAVEL, WAGE NEGOTIATIONS AND LIMITS USE OF GOV'T VEHICLES". VI Consortium. VI Consortium. Retrieved February 16, 2017. ^ "The Sin Tax is Now Law". NewsofStJohn.com. March 24, 2017. Retrieved July 27, 2017. ^ "Travel and Tourism in US Virgin Islands". Euromonitor. Euromonitor. 2015. Retrieved February 15, 2017. ^ Andrew (February 19, 2012). "USVI, NREL Partner to Reduce Fossil FuelS 60% by 2025". CleanTechnica. Retrieved December 13, 2012. ^ "Energy > Oil > Consumption > Per capita: Countries Compared". Archived from the original on 7 July 2017. ^ "U.S. Virgin Islands Water and Power Authority (WAPA)". Viwapa.vi. Retrieved December 13, 2012. ^ "Central America and Caribbean – VIRGIN ISLANDS – Economy". CIA. CIA. 2014. Retrieved February 15, 2017. ^ "U.S. INSULAR AREAS, Application of the U.S. Constitution" (PDF). U.S. General Accounting Office. November 1997: 37. Retrieved July 16, 2012. US federal individual and corporate income taxes as such are not currently imposed in US insular areas. ^ a b "Virgin Islands Tourist Tips". Here.VI Search. WebMastersVI.com. Archived from the original on February 10, 2009. Retrieved January 24, 2010. ^ "Official USPS Abbreviations". United States Postal Service. Archived from the original on March 28, 2009. Retrieved January 24, 2010. ^ a b "Virgin Islands General Information". United States Postal Service. Archived from the original on December 25, 2009. Retrieved January 24, 2010. ^ "St Thomas, VI". Zip-Codes.com. Datasheer, LLC. Retrieved January 24, 2010. ^ "Christiansted, VI". Zip-Codes.com. Datasheer, LLC. Retrieved January 24, 2010. ^ "St John, VI". Zip-Codes.com. Datasheer, LLC. Retrieved January 24, 2010. ^ "Frederiksted, VI". Zip-Codes.com. Datasheer, LLC. Retrieved January 24, 2010. ^ "Kingshill, VI". Zip-Codes.com. Datasheer, LLC. Retrieved January 24, 2010. ^ "Census 2010 News | U.S. Census Bureau Releases 2010 Census Population Counts for the U.S. Virgin Islands". 2010.census.gov. Archived from the original on November 1, 2012. Retrieved December 13, 2012. ^ "U.S. Virgin Islands". Pew Research. Pew Research. 2016. Retrieved February 21, 2017. ^ "Census 2010 News | U.S. Census Bureau Releases 2010 Census Ethnic Counts for the U.S. Virgin Islands". 2010.census.gov. Archived from the original on February 10, 2013. Retrieved March 23, 2013. ^ "Virgin Islands Language". Vinow. VI Now. 2016. Retrieved July 6, 2016. St. Croix was owned by the French until 1733 when the Danes bought it. By 1741 there were five times as many English on the island as Danes. English Creole emerged on St. Croix more so than Dutch Creole, which was more popular on St. Thomas and St. John until the 1800s. ^ Detailed Tables – American FactFinder Archived November 10, 2011, at the Wayback Machine United States Census Bureau Retrieved January 11, 2011. ^ Îles Vierges américaines. Tlfq.ulaval.ca. Retrieved on July 26, 2013. ^ Hastings, S. U.; MacLeavey, B. L. (1979). Seedtime and Harvest: A Brief History of the Moravian Church in Jamaica 1754–1979. Kingston (Jamaica): Moravian Church. OCLC 10506410. ^ "Chabad Lubavitch Jewish Center of the Virgin Islands – Your Soul Resort In America's paradise". Jewishvirginislands.com. Retrieved December 13, 2012. ^ "Life in Denmark and 2017 centennial in St.Thomas of U.S. Virgin Islands". Archived from the original on May 13, 2016. Retrieved May 11, 2016. ^ "Virgin Islands Daily News | virginislandsdailynews.com | A Pulitzer Prize Winning Newspaper, Virgin Islands Guide, Virgin Islands InfoVirgin Islands Daily News". Dailynews.vi. Retrieved December 13, 2012. ^ "Welcome to the Frontpage". Stjohntradewindsnews.com. Retrieved December 13, 2012. ^ "Virgin Island Vacation Guide – What to Do, Restaurants, Hotels in St Thomas & St John". virginislandsthisweek.com. ^ "St John On Island Times". St John On Island Times. Retrieved 2014-01-21. "Virgin Islands". The World Factbook. Central Intelligence Agency. Real-time, geographic and other scientific resources of Virgin Islands at the United States Geological Survey. This page was last edited on 29 March 2019, at 05:37 (UTC).